Gemstone Ayurvedic malas to match your dosha. Chakra mala bead bracelets heal the chakras. In simplest form, a closed strand with a tassel. Significantly holding 108 gemstones with summit or meru bead. A necklace with a pendant used for keeping count in 108 meditations is another type of mala. This type of mala is also called a yoga mala. Mala bead necklaces also help you keep count in a mantra. Most importantly, these malas have a symbolic pendant. Almost always a sacred symbol such as the OM, lotus, deity or tree of life. In addition, a mala necklace is a good choice because it can be worn in any setting. Finally, high quality gemstones are the foundation of our mala necklaces. We have yoga malas made from gemstones to match the doshas. In contrast to the other mala beads, these combine gemstones with the appropriate metals for ayurvedic dosha balance. Another way to address dosha imbalance. Importantly, the gemstones used in mala beads for pitta are cooling. In contrast, the the components for Kapha are heating. In addition, the gemstones used for Vata are grounding. Mala Beads used for keeping count in 21 or 27 meditations. This type of mala is also called a Buddhist Bracelet or Wrist mala. Also called a yoga bracelet. These mala beads help you keep count in a shorter mantra. Furthermore, useful for wearing in activities off the mat. Buddhist Bracelets have counters at 7. Yoga bracelets made to last and move with you. 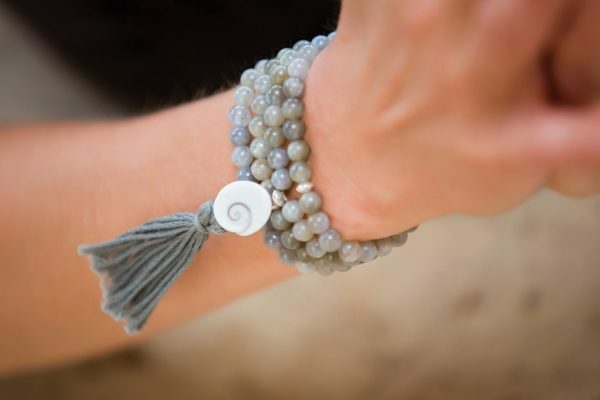 High quality gemstones are the foundation of our mala bracelets. A sacred symbol is the finishing touch to these bracelets. Finally, we use strong stretch cord that is supple yet durable. These bracelets balance the energy body. Stretchy and flexible, another bracelet to wear in yoga class. Furthermore, people wear chakra bracelets during healing sessions. Above all, each bracelet includes a Sanskrit chakra symbol. As well, these bracelets are popular for healers to wear during client work. Ayurvedic bracelets match the doshas with gemstones. Also, used for keeping count in short meditations. Unlike the other mala bracelets, these combine gemstones with the appropriate metals for ayurvedic dosha balance. In addition, this mala is best for addressing imbalance. You can wear Ayurvedic bracelets to keep your affirmation with you. Likewise, high quality gemstones are the foundation of our Ayurvedic bracelets. Due to element considerations, Pitta, Vata, and Kapha require different gemstones. Yoga jewelry includes rings, earrings, and necklaces. In addition, all of our yoga jewelry includes sacred symbols or gemstones. Yoga jewelry is a great way to add the healing properties to your practice. Indeed, all yoga rings include symbols like the lotus, OM, or serpent. While yoga earrings include healing gemstones. Because if this, yoga earrings bring your yoga practice into everyday wear. Significantly, our yoga earrings are 24k gold plated or sterling silver. High grade gemstones. Unlike mala necklaces, this allows you to wear your intentions in a subtle piece of jewelry. Significantly, we have made thousands of malas for thousands of practitioners. Consequently, you can learn more about private label manufacturing for your brand and custom design. Please note, at this time we are only doing custom work for private labels, not individual purchases. Finally, we offer a limited selection of mala beads for wholesale purchase. We no longer offer drop shipping. All of our work is limited edition from rare components. In addition, our showroom is open every week. While most mala companies import from overseas, we make all of our products by hand in an artisan tradition. Our showroom features one of a kind pieces not offered for sale elsewhere. Current hours are Thursday – Sunday 12 – 4pm, or by appointment. Furthermore, we are now Studio 26 on the Salt Spring Studio Tour.